Jean-Pierre Melville was known for making genre films with rambling narratives that delighted in taking all kinds of plot diversions. His seventh film, Le Doulos (1962), based on the novel by Pierre Lesou, deviated from his usual approach to produce a lean, straight-forward narrative crime film. It also anticipated Melville’s future crime-thriller masterpieces, Le Samourai (1967) and Le Cercle Rouge (1970). Le Doulos begins with typical noir imagery: a man in a hat and trenchcoat walks along deserted city streets to a foreboding score that seems to hint at his impending doom. The man’s name is Faugel (Reggiani) and he’s just been released from prison. In a matter of minutes he kills a local fence for his money and jewelry – apparently settling an old score. Faugel meets up with Silien (Belmondo), a criminal associate who is a ruthless sociopath not above tying up and slapping around Faugel’s girlfriend for information. He ends up double-crossing Faugel on what should have been a routine home invasion. The cops show up, shots are fired, people die, and Faugel narrowly escapes despite being wounded. He realizes that Silien set him up and decides to get revenge. As the film continues, one quickly picks up a decidedly fatalistic vibe: this is not going to end well for anyone. 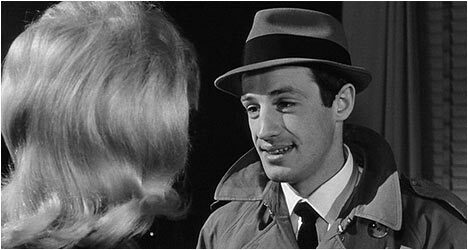 Fresh off of Jean-Luc Godard’s Breathless (1960), Jean-Paul Belmondo is excellent as a cold, calculated criminal that is oddly charismatic thanks to the actor. Our sympathies like with Faugel as played by Serge Reggiani because he is being unfairly set up by Silien. Or is he? Melville presents a tough, criminal underworld where life if predictably cheap and on one can be trusted. They are tried and true clichés but are executed so well that they seem fresh and new. There are no truly good or bad characters in this film – there are elements of both in everyone in Le Doulos. Melville plays with out notion of perception and includes plot twists that keep us guessing right up to the final scene. There is a select-scene commentary by film scholar Ginette Vincendeau. She talks about the opening credit sequence and how it establishes the themes of Le Doulos. Stylistically, this sequence evokes American film noir of the 1940s. Vincendeau picks a scene that develops the character of Silien. She analyzes the clothes that the characters were. Finally, she takes a look the film’s conclusion and how our perception of the characters and the events in the film change. “Archival Footage” features excerpts from three French television programs from the 1960s and 1970s. In the first one, Melville and Belmondo talk about the film. In the second one, Reggiani is interviewed about his career and is quite candid. In the last one, Reggiani is a few years old and talks about the film with Melville joining him. Also included is an interview with filmmaker Bertrand Tavernier who was a publicist for Le Doulos. He talks about meeting and working with Melville. The actor offers his recollections of working on the films and he tells some good stories. There is an interview with filmmaker Volker Schlondorff who was an assistant director on Le Doulos and he talks about his impressions of Melville. He goes on to tell some very engaging and fascinating stories about the man. Good stuff.